Some people are just good with colour, I am not one of them. I naturally lean towards chaos in colours or maybe it's that I simply don't see colours the same as most other folk. I know what looks nice when I see it but somehow I can't predict beforehand what is going to look nice. 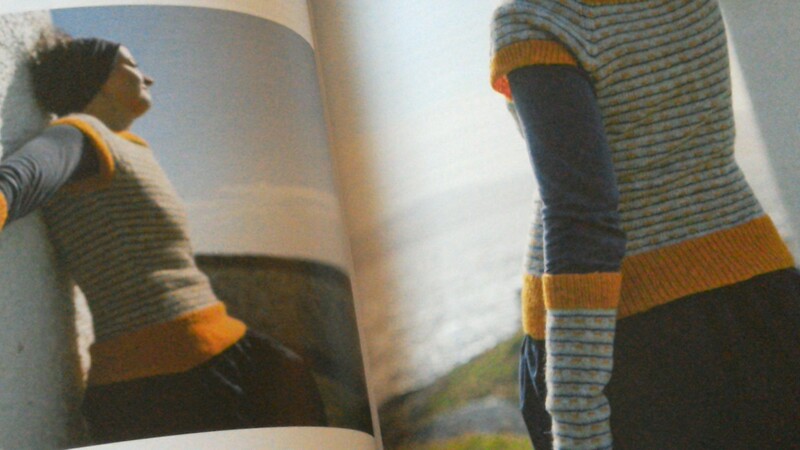 I bought a beautiful book of knitting patterns. It's called Colours of Shetland. 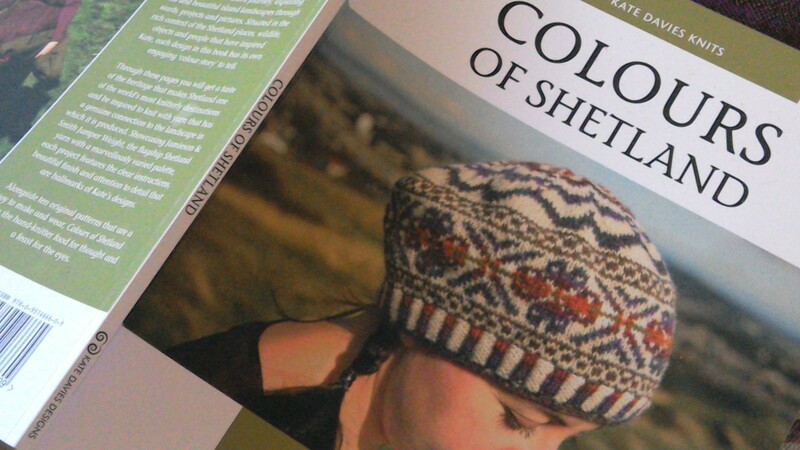 It is a goal of mine to learn how to do fairisle knitting and the colour combinations in this book appealed to me. 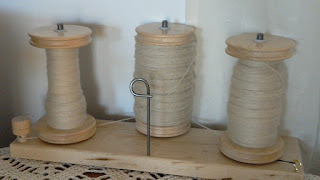 So my challenge was to make almost all the patterns in the book (there is only one I dislike) but using my own homespun yarn. That means, spinning and dying the yarn myself. 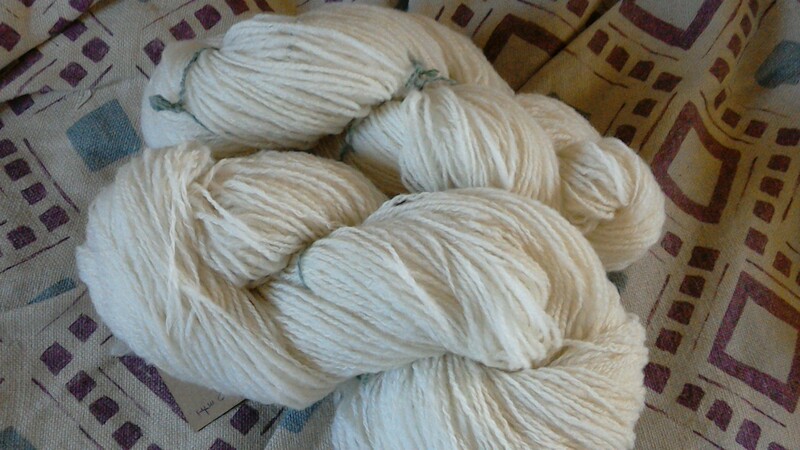 I didn't even know what size a Shetland Jumper weight yarn was! Well ok, a little research gave me the answer to that one. So I started on my first favourite from the book and spun enough yarn to make the fingerless gauntlets that go with the jumper. It took me a long time to decide whether to go with the same colour scheme or not. I have a limited number of dyes (due to cost) and I knew that I would not be able to match exactly her colours. 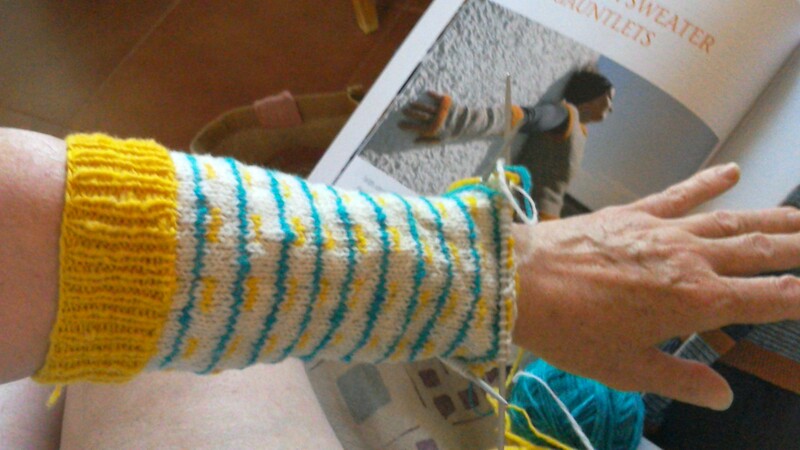 So, accepting that the decision was whether to stick to yellow, blue and white or choose a different colour combination entirely. You may already have seen that her colour scheme isn't actually yellow, blue and white but ORANGE. I didn't notice that until now. Perhaps I have a kind of colour blindness? 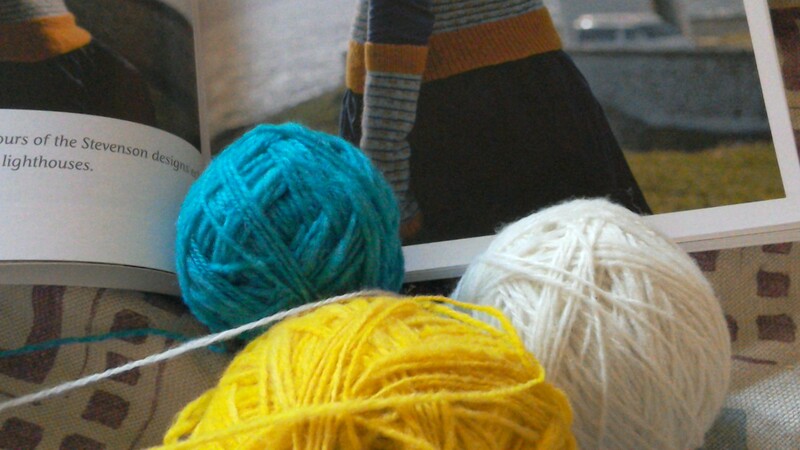 So, I opted for her original colourways because I wasn't sure which other three colours would look good. And I measured out the dyes and very excitedly dyed the yarn. At this point I did mention to my other half that it was going to be brighter in colour than the book. No matter, he said, bright is good. 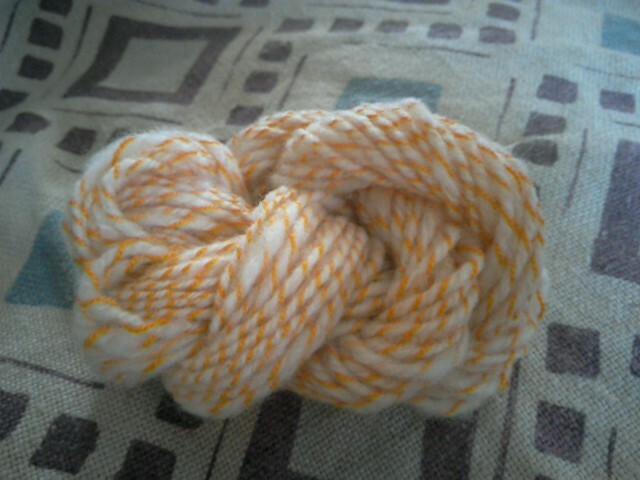 So I began knitting. I knitted for a couple of days with a growing sense of unease. Look. It's totally different. And I'm not sure that I like it. I mean it's very much the colours of Spain, that bright, hot, searing sunshine and sky that is typical of even winter days here, rather than the muted, rain washed subtlety of a northern Scottish sky. Dreich is the Scots terminology - it means bleak, damp, rain streaked, grey - basically a typical spring morning in the far north. These are not words to describe the colour scheme I've ended up with. Why I didn't realise this before is neither here nor there. The question is do I continue or not? Should I try to achieve similar darker colours like the ones she has used? Or totally different colours perhaps? And if the latter, which colours? 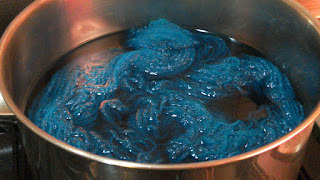 My choices of dye are limited as I said and also the exact colour that I get is not really controlled due to my inexperience. But I have the possibility of dark brown, tea stain, pinky, yellow, teal blue (light to quite dark), silver grey (untested so not sure how this looks on yarn), moss green (light to darkish) and of course the natural white. All of the above can be modified by the addition of copper or iron (which is supposed to sadden the colours) but I have no control over the outcome. 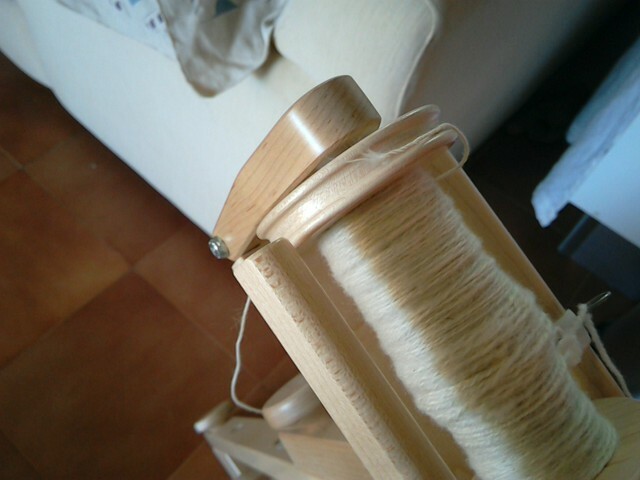 Also, I will have to start spinning more yarn, it really is almost back to the beginning again.